Who was Agrippina the Younger? 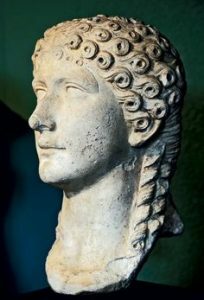 Agrippina the Younger was Caligula‘s oldest sister, so like him she was the daughter of Germanicus and Agrippina the Elder, and she was a great-granddaughter of Augustus. Agrippina was born at Colonia Agrippinae (modern Cologne) in 15 AD. So she was three years younger than Caligula. Her father died when she was four. (Tiberius may have poisoned him.) When Agrippina was twelve, Tiberius sent her with her brother and sisters to live with her great-grandmother Livia. She may have gotten to know her cousin Claudius at this time. Agrippina escaped this situation the next year, when she was thirteen, by marrying her second cousin, Gnaeus Domitius Ahenobarbus. 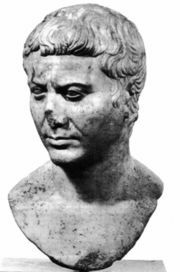 (He was 45 years old) Then the next year, Tiberius arrested and killed her mother and older brothers. After Tiberius died in 37 AD, and Agrippina’s brother Caligula became emperor, Agrippina joined him at court, where she went to his parties. She was now 22 years old, and she had a little baby, the future emperor Nero. Agrippina’s husband Ahenobarbus died (at age 57) in 40, when Agrippina was 25 years old. And the Praetorian Guard killed Caligula the next year. Agrippina’s uncle Claudius became emperor. After Claudius killed his wife Messalina, he decided to marry his niece Agrippina. They got married in 49 AD, when she was 34 years old. Agrippina was old enough now to want political power, and she did get a lot of power. She commanded part of the Roman army, and she was the first woman to be called “Augusta”. To get more power, she convinced Claudius to adopt her son Nero. More than that, she got Nero engaged to marry Claudius’ daughter Octavia. Agrippina continued for several years to share power with her husband Claudius. But by 54 AD Agrippina had a problem. 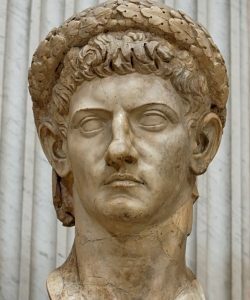 Claudius’ own son Britannicus (with his earlier wife Messalina) was thirteen, and would soon be old enough to rule if Claudius died. Claudius was beginning to think that he would rather hand power over to his own son than to Agrippina and Nero (who was now 17). Agrippina was 39 years old when she killed Claudius. She kept power for a while. While Agrippina was in power, she attended meetings of the Senate, though she had to sit behind a curtain because she was a woman. When the Parthian king Vologases took control of Armenia, a Roman ally, Agrippina sent her general Corbulo to get it back. But in the end Nero decided he wanted to rule on his own. Agrippina threatened to support Britannicus instead of Nero, and to have Nero killed, and Nero was scared enough by this to decide to kill Agrippina himself. It took several tries – first Nero tried cutting a hole in her bedroom ceiling so it would fall on her in the night, then he tried smashing a hole in the bottom of a small boat she was using, but she swam to shore. Finally Nero’s guards found her and just stabbed her to death. Agrippina died in 59 AD, when she was 44 years old. Cite this page: Carr, K.E. Agrippina the Younger – history of Rome. Quatr.us Study Guides, September 2, 2017. Web. April 20, 2019.